Aki Olavi Kaurismäki (Finnish: [ˈɑki ˈkɑurismæki] ( listen); born 4 April 1957) is a Finnish screenwriter and film director. He is described as Finland's best-known film director. 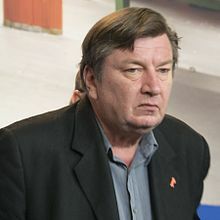 After graduating in media studies from the University of Tampere, Aki Kaurismäki started his career as a co-screenwriter and actor in films made by his older brother, Mika Kaurismäki. He played the main role in Mika's film The Liar (1981). Together they founded the production company Villealfa Filmproductions and later the Midnight Sun Film Festival. His debut as an independent director was Crime and Punishment (1983), an adaptation of Dostoyevsky's novel set in modern Helsinki. He gained worldwide attention with Leningrad Cowboys Go America (1989). In 1989 he emigrated with his wife to Portugal, saying "in all of Helsinki there is no place left where I could place my camera". Kaurismäki is known for his extremely minimalistic style. He has been called an auteur, since he writes, directs, produces and usually edits the films himself, and thus introduces his personal "drollery and deadpan" style. The dialogue is famously laconic: the articulation is usually extremely unadorned, direct and in strict standard language, without showing much emotion or drama. Characters usually stand still and recite the dialogue like it consisted of eternal truths. His characters rarely smile, nod sadly and usually expect the worst, and often smoke constantly. The camera is usually still. Events are shown in a plain manner and characters are usually left alone facing the consequences. However, despite their tragedies and setbacks, the characters don't give up and eventually survive. Much of Kaurismäki's work is centred on Helsinki, such as the film Calamari Union, the Proletariat trilogy (Shadows in Paradise, Ariel and The Match Factory Girl) and the Finland trilogy (Drifting Clouds, The Man Without a Past and Lights in the Dusk). His vision of Helsinki is critical and singularly unromantic. Indeed, his characters often speak about how they wish to get away from Helsinki. Some end up in Mexico (Ariel), others in Estonia (Shadows in Paradise, Calamari Union, and Take Care of Your Scarf, Tatjana). Kaurismäki also uses, on purpose, characters, elements and settings that hark back to the 1960s and 1970s. Kaurismäki has been influenced by the French directors Jean-Pierre Melville and Robert Bresson, the Japanese director Yasujirō Ozu and some critics have also inferred the influence of Rainer Werner Fassbinder. His movies have a humorous side that can also be seen in the films of Jim Jarmusch, who has a cameo in Kaurismäki's film Leningrad Cowboys Go America. Jarmusch used actors who have appeared frequently in Kaurismäki's films in his own film Night on Earth, part of which takes place in Helsinki. Kaurismäki has been a vocal critic of digital cinematography, calling it "a devil's invention" and saying he "won't make a digital film in this life". In March 2014, however, he reconciled, saying that "in order to maintain my humble film oeuvre accessible to a potential audience, I have ended up in rendering it to digital in all its present and several of its as yet unknown forms." Kaurismäki's film Ariel (1988) was entered into the 16th Moscow International Film Festival where it won the Prix FIPRESCI. Kaurismäki's most acclaimed film has been The Man Without a Past, which won the Grand Prix and the Prize of the Ecumenical Jury at the 2002 Cannes Film Festival and was nominated for an Academy Award in the Best Foreign Language Film category in 2003. However, Kaurismäki refused to attend the Oscar ceremony, asserting that he did not feel like partying in a country that was in a state of war. Kaurismäki's next film Lights in the Dusk was also chosen to be Finland's nominee for best foreign-language film, but Kaurismäki again boycotted the awards and refused the nomination, in what he claimed was a protest against U.S. President George W. Bush's foreign policy. In 2002 Kaurismäki also boycotted the 40th New York Film Festival in a show of solidarity with the Iranian director Abbas Kiarostami, who was not given a US visa in time for the festival. Kaurismäki's 2017 film The Other Side of Hope won the Silver Bear for Best Director award at the 67th Berlin International Film Festival. At the same festival he also announced that it would be his last film as a director. ^ Andrew Nestingen (June 2013). The Cinema of Aki Kaurismäki: Contrarian Stories. Columbia University Press. ISBN 978-0-231-85041-4. ^ Peter Bradshaw (5 April 2012). "Le Havre – review". The Guardian. ^ a b "Aki Kaurismäki Crosses the Digital Rubicon". Antti Alanen: Film Diary. 28 March 2014. Retrieved 28 March 2014. ^ ""I am a filmmaker not a pixelmaker" - An interview with Aki Kaurismäki". Phil on Film. 2 April 2012. Retrieved 28 March 2014. ^ "Festival de Cannes: The Man Without a Past". festival-cannes.com. Retrieved 2009-10-25. ^ Bohlen, Celestine (2002-10-01). "One Visa Problem Costs a Festival Two Filmmakers". The New York Times. Retrieved 2008-09-05. ^ Roxborough, Scott (18 February 2017). "Berlin: Aki Kaurismaki Wins Best Director for 'The Other Side of Hope'". The Hollywood Reporter. Retrieved 21 February 2017. ^ "Legendary filmmaker Aki Kaurismäki: There will be no more films". Yle Uutiset. 16 February 2017. Retrieved 21 February 2017. ^ "Match Factory picks up Kaurismäki’s Le Havre"
^ "Aki Kaurismaki’s Next Film ‘The Other Side Of Hope’ Gearing Up"
Ródenas, Gabri (2008), "The Poetry of Silence" in , Orimattila Town Library. 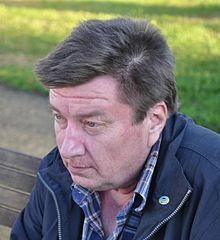 Wikimedia Commons has media related to Aki Kaurismäki.